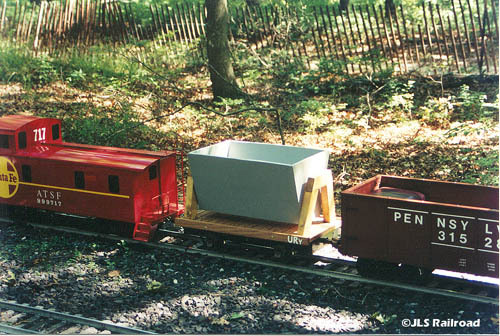 The ore tipper is a small 2 axle, 2' 6" long car. The main frame of the car is a 1/8" thick aluminum sheet. To the bottom is bolted a 1" by 2" tubular steel beam which runs the length of the car for support. It is also there to absorb any impact from another train. The deck is made from red oak, each slat hand cut by myself, as well as the side frames. 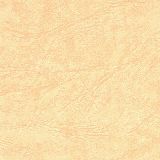 The tipper portion is made of 3/4" ply wood. The tipper pivots on a steel rod, 3/4" in diameter and has a full range of motion. The car weights (empty of a load) about 80lbs. 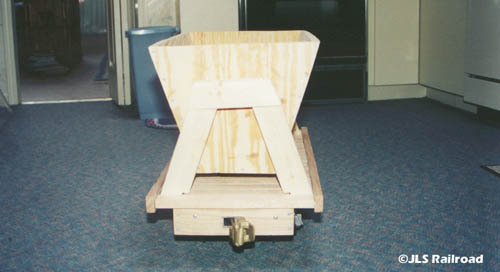 The entire ore tipper was constructed using nothing more then simple hand tools, a Digital Dremel and small hand held jig saw. Here you can see the entire car from the side. Notice the wooden deck before painting. This angled view makes it easy to see the tipper supports. Here is another good shot of the tipper supports. 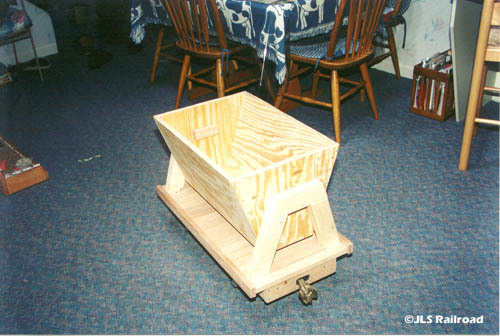 The tipper bucket is about 3" from the deck when sitting up straight, in the above position. 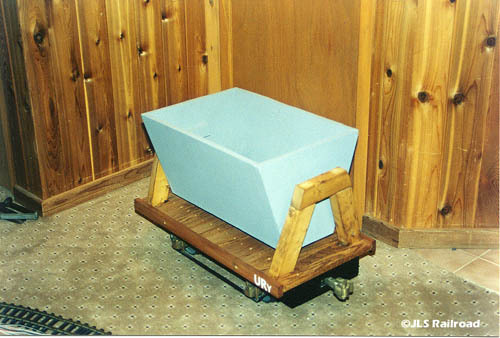 When tipper to either side, the downward facing corner of the bucket comes about 1" from the deck. It has been tested with or without a load in it, the height doesn't change. The trucks of the ore tipper are from Mountain Car Company. 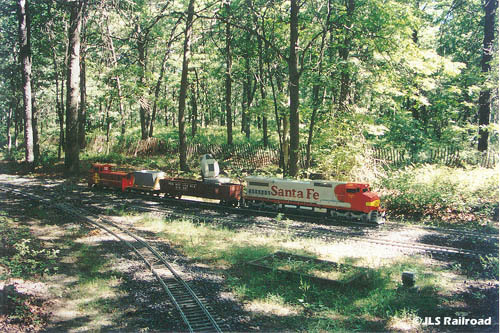 They are small, 2 axle sprung trucks. To prepare them for use, they needed to be assembled. The axles feature sealed ball bearings. Then, once the axles were ready to go the side frames of the wheel set had to be sized and bolted to the car's side frame. 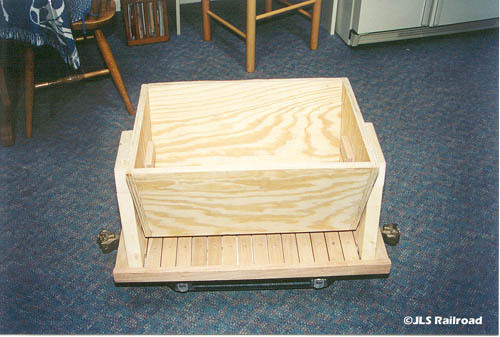 Then, it was just a matter of over turning the car, sliding the wheel assembly in the journal boxes and up into the wheel set's side frame. The hardest part was sitting on the axle to compress the spring so the assembly could be screwed down. One spring did escape though, it shot all the way across the room. We retrieved it, installed it and finished up. Here you can see the trucks. The journal boxes are fully functional and slide up and down in the guides. 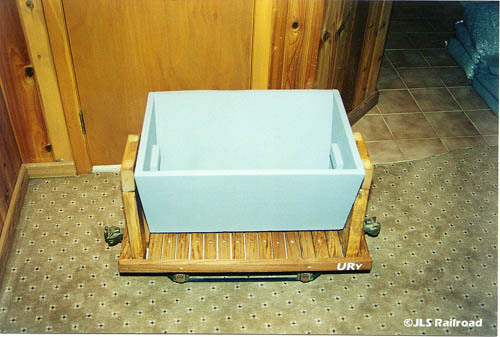 The side frame of the wheel set is that bar going from truck to truck along the bottom of the journal boxes. This is the underside of the car. In the blown up picture (click the small picture above) you can see everything. The center beam (1" by 2" tubular steel) is running the length of the car. All those machine screws are either securing deck members or the actual under frame to the side frame. 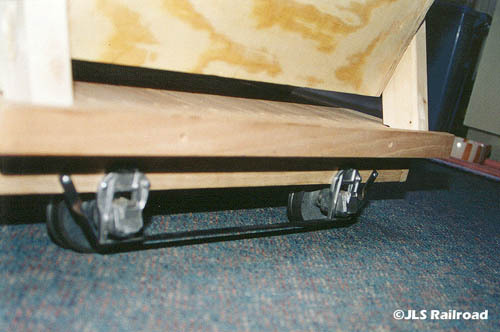 The 3 large bolts running down the center of the tubular steel is what holds the entire wheel structure and under frame to the deck and tipper. They are 1/2" bolts. Here you can easily see the wheel and journal box. 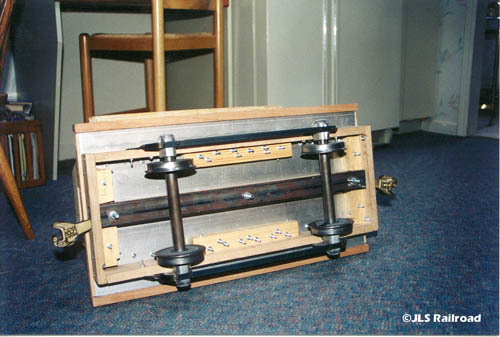 The journal box is fully functional, sliding up and down in the guide, controlled by the spring. Here is the finished product, all painted and stained. The journals and supports have been weathered to the best of my ability. I think it came out quite nicely! If you remove the tipper and blink your eyes, it actually blends into the wall in the background, haha. 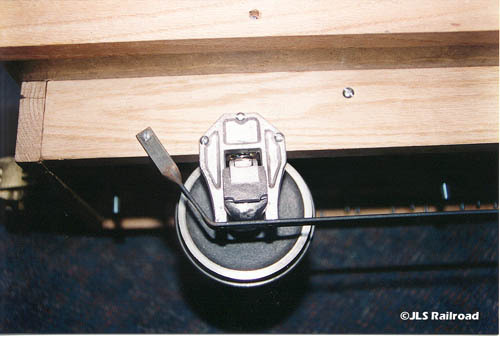 Here is a shot from above, you can see the two support blocks that secure the pivot rod on the inside of the bucket. 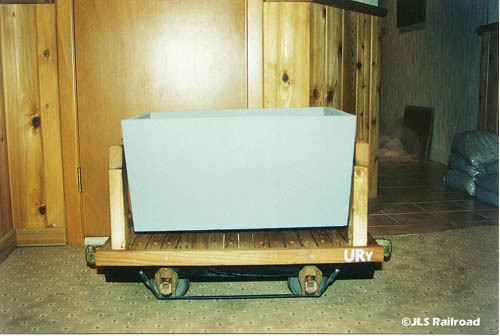 The Ore Tipper has been labeled Uintah Railroad, as you can see from the home made URY decal in the right corner of the side frame.